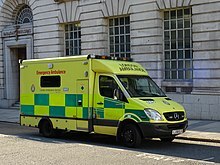 ^ "Ambulance Service Definition". Archived from the original on 28 October 2007. Retrieved 2007-06-15. ^ "A & E Patients Set for the Sabbath" (PDF). Gateshead Health Matters. Gateshead: Gateshead Health NHS Trust. 73: 2. April 2004. Archived from the original (PDF) on 2008-11-12. Retrieved 2008-09-16.